This photograph of a baseball signed by Don Van Vliet in 1982 at a press conference he held to promote Ice Cream For Crow replaces my previous post here. That post concerned the May release of audio from the press conference. The website owner who owns the tape of the press conference has been so overwhelmed by applications from visitors here that he has asked me to remove the name of his website and links to it. I hope to be able to bring you news of an alternative arrangement in due course. The smoke is already clearing. 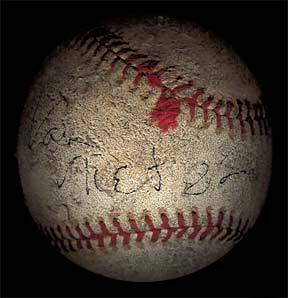 I keep it in one of those classic MLB plastic baseball display thingies – to the uninformed, it could be Pete Rose’s signature! The baseball is probably my most prized possession of all time and maybe I’ll leave it to the Smithsonian (or Hard Rock Cafe Mojave Desert) one day. Maybe those of us lucky enough to get the file can host it somewhere? OK, that explains the lack of response about the link to the interview. It could be torrented via a site like dimeadozen.org if a non-compressed transfer of the tape is available. That way it can circulate among fans and collectors but KB won’t have to bear the download load. I’m surprized bits and pieces (or a transcription) pf the press conference hasn’t surfaced in the 25 years since it happened. The last few comments here have resembled something between spam and a shouting match. I have removed them and disabled further comments to this post. When there is definite news of the release of this audio I hope to be the first to let you know.